This season Argos has really upped its game with really lovely homeware and furniture. Following on from yesterday’s post on open furniture, this storage unit from their Nomad range has great looks and is also practical. Perfect for a living room for displaying books, ornaments and storage boxes. Or perhaps in a kitchen for displaying ceramics and tableware. Plus the cabinet space at the bottom is ideal for hiding away the things you don’t want your guests to see. We love this mesh storage unit from roseandgrey.co.uk. The simple stylish design finished in black will work in any room. Fill with books, plants and ornaments, showing off your favourite things. As we have said in the past we are certainly partial to a bit of concrete and brutalism in our homes. What is great to see, is that this material is accessible to all with more stores introducting home accessories and furniture using concrete. Last year and a large part of this year we have seen concrete sit alongside metalics, like copper, brass and gold. Now we are seeing a more sedated, subtle use of concrete mixed with glass and wood. Of course the metal additions are still there, but more toned down, likely in brushed brass and black finishes. The great thing about concrete is that it comes in all shapes and sizes, and works in all rooms. Vases and table tops in the living room, pendant lights in the bedroom, utensil pots in the kitchen or stationary storage in an office. The options are endless. 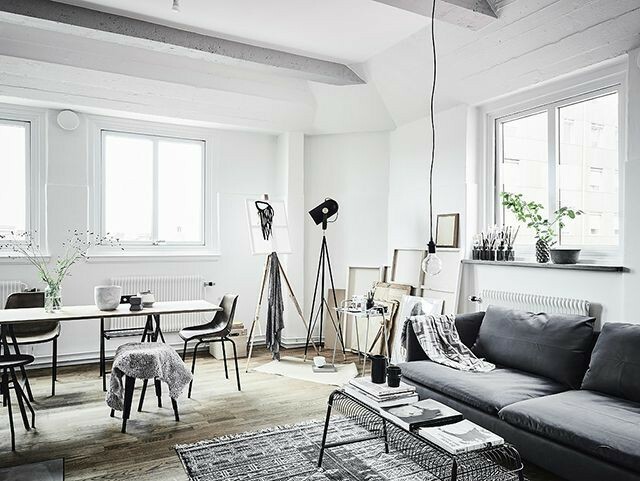 Concrete lends itself really well to industrial, Scandinavian and monochrome interiors, but it can also make a statement in other settings. A concrete lamp base or table top, can be dressed up with colour and print to suit. The real winner for using concrete in your home is to blend it with neutral tones and mixed textures. There are no rules so have a go at introducing this material into a room and we garauntee you will go back for more. Now is the time to start making our living rooms more cosy, with more textures and layers. We have found a tutoral for a felt pouf which looks great and can double up as a seat and table for a tray. You may need to have some basic sewings skills to attempt this one, but its worth it. Layer it with a faux sheepskin for ultimate coziness, put your feet up and relax. This desk top clock from Ikea would make a great addition to any room. It’s stylish brushed gold and black finish give a more expensive feel. It’s actually only £12 and would sit nicely amongst vases, frames and other ornaments on a shelf or tabletop. Get onboard with one of this years biggest trends – velvet – and update your sofa at the same time. These gorgeous cotton velvet cushion covers from hm.com come in 9 different colours, so you are sure to find a favourite, and what’s even better is that they are only £6.99. Mix a couple of colours together along with some contrasting printed cushions to bring interest and a fun update to your living room.